Last week we had a small family birthday party for my eldest son. I always let my kids choose what theme they would like for their party. 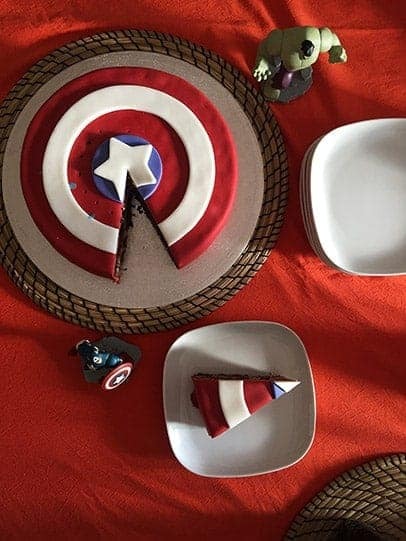 This year Daniel wished to have an Avengers party. 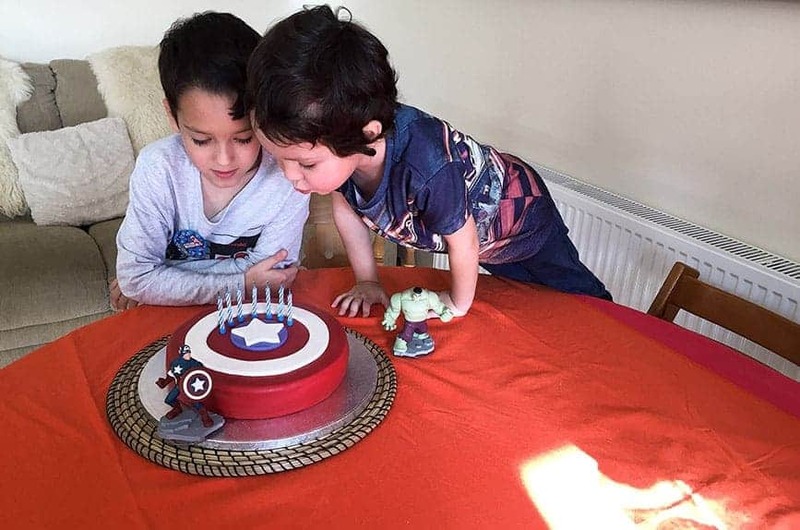 I usually use birthdays as an opportunity to create more difficult, carved birthday cakes for my boys. I can easily spend 2 days making it. I don’t rush it. I make sponges and filling one day. Stick it all together and leave it in the fridge till next day for the sponge and filling to cool down and set. Next day I carve the desired shape from it and I decorate it. We already had all sort of parties – dragon, dinosaur, cowboy, vampire, formula 1 or train party. Honestly, I have to say I was disappointed with the party theme my son chose this time. I couldn’t decide how the cake should look. I get usually inspired by wooden toys and vintage toys or I just make a few drawings but it didn’t work on this occasion. We haven’t had this hero/ popular figures obsession in our house yet but it might change soon as Avengers and Godzilla followed by Pokémons are more and more in centre of my boys’ attention. 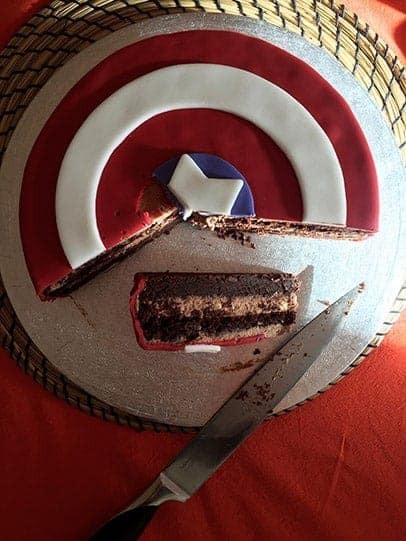 After some struggle, I decided to ask Google for help with the Avenger cake. 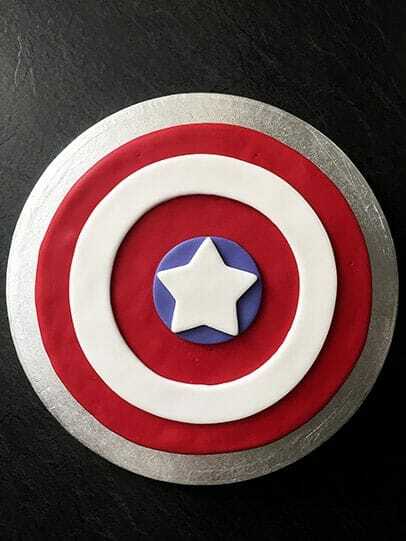 I found a picture of a round cake decorated as a Captain America’s shield. It was easy and simple and it wasn’t overly decorated. Great for me as I don’t like over-decorated cakes. So, in the end, I didn’t make my own creation but I copied someone else’s cake (I’m a bit ashamed). 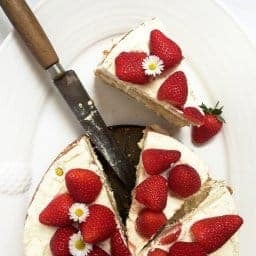 For bigger, more advanced carved cakes I like to use a less fragile sponge and American style butter icing, once it gets cold it holds its shape and it’s not delicate. The cake design I settled on this time had very basic round shape and decoration was simple so I let Daniel choose the flavours. He asked for a dark chocolate brownie sponge with creamy milk chocolate filling. It turned out very tasty and yummy as well as rich and quite filling. We all enjoyed the cake very much. 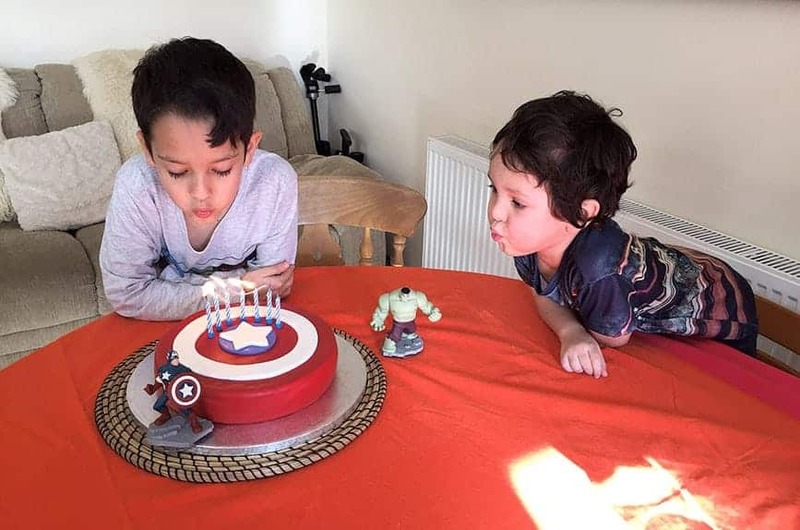 The most importantly the birthday boy loved his Avenger cake and to make him even happier we gave him an Avenger hero game for the x-box. The game contained several plastic hero figures that I put next to the cake on the table. It added nice final touch. As a surprise, we took Daniel to the indoor BMX/skate park – Source Park in Hastings to add that cherry on top to his special day. He loved it at least as much as he loved his chocolate brownie cake. The skate park place is amazing. It’s under the seafront right next to the Pier. The building is perfect for this purpose. It looks run down and cool at same time. Exactly how I imagine a skate park to look. There is a skate shop and a coffee shop too. I was very grateful for the coffee shop as I needed a big hot coffee to keep me from becoming an icicle. As you can imagine February is a cold month and the skate park area doesn’t have any heating. To be fair all those busy kids on their bikes and scooters don’t need it at all. When Daniel finally stopped after 2 hours of constant scooting he was very sweaty. When we arrived back home we had one very happy, overjoyed and exhausted seven-year-old boy. I guess that that night he dreamt about a big Avenger adventure in the skate park. 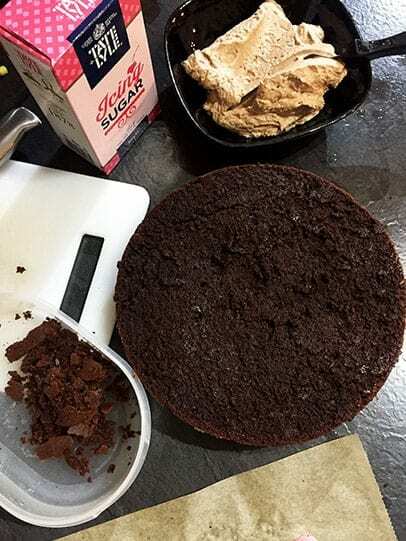 PS: I was asked to make the cake again so I decided to turn it into a chocolate brownie Easter cake and I am pleased to share the recipe with you.